After becoming a talking point for its design, TECHNOGRAPH still has many surprises in store. It began by being highly technical before, over the years, revealing a dial dressed up in the most extraordinary materials: lizard and python skin or slate… Today, Paul Picot is taking up a new challenge and unveiling a technical innovation in Basel: the new TECHNOGRAPH has acquired a complex system to show the time on rotating disks, so making the time display still more original. While the generous dimensions of the TECHNOGRAPH case remain unchanged with a modern and avant-garde presentation, the astute system of two superimposed dials has undergone a far-reaching change. On the original model, the hours and minutes are displayed on the upper central dial, mounted in the centre of the timepiece. The real time seconds and the chronograph minutes are shown in turn on the lower dial in two small half moon-shaped counters, working with an ingenious system of hands of two different lengths. Proud of the originality and effect obtained by this entirely new way of showing the time, Société des Montres Paul Picot wanted to go one step further. The aim was to find a technical evolution worthy of the TECHNOGRAPH which, in the space of just a few years, has made a name for itself among exceptional timepieces. The challenge was to incorporate a new and still more technical dial with a “clou de Paris” décor, without impairing the subtlety of its design or the codes which were the key to its success. While the idea may seem simple, its implementation called for the utmost care and a total commitment by the master watchmakers of the House of Picot. The result reveals astonishing elegance and originality. The hands of the half moon-shaped counters have been replaced by fine disks mounted flush with the lower dial. Each of these disks has two different colours: the disk at 9 o’clock is yellow and blue and the second at 3 o’clock red and black. Each disk comprises two opposing arrows, one facing outwards and the other inwards; a perfect division of the disk into two parts between the colours is obtained in this way. Paul Picot has successfully risen to the challenge and preserved the identity of the TECHNOGRAPH, while taking a subtle step forwards thanks to a superb technical prowess. 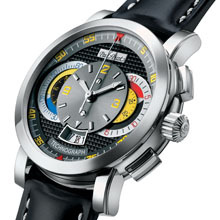 The first 30 seconds of real time now unfurl in yellow, with the arrow facing inwards pointing to the numerals from 0 to 30 engraved on the lower dial. The second disk arrow, this time facing outwards, then takes over for the next 30 seconds, this time in blue. The same principle is followed for the chronograph minutes: the first 15 minutes are shown in black by means of the arrow facing outwards on the disk and the next 15 in red with the arrow pointing inwards. With its highly complex design, this new system for showing the time makes the counters extremely easy to read. Paul Picot has placed its watchmaking expertise at the service of connoisseurs. Last but not least, the originality of this dial culminates in a patented system for date display in the window in which the day’s date is always highlighted in red, while the previous and following days are displayed in grey. Faithful to its philosophy of Noblesse du détail, Paul Picot presents, in the shape of its TECHNOGRAPH DISCOTIME, a sophisticated and vibrant timepiece with a dial featuring a subtle interplay of colours. This is yet another example of the particularly successful fusion between mastery of watchmaking techniques and bold design, enabling the House of Le Noirmont to assert its identity and specialisation in exclusive mechanical timepieces. 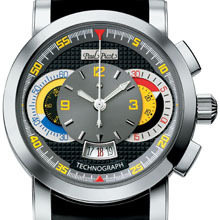 Special Technograph display with rotating disks for the small seconds and the minutes counter of the chronograph.